This will be a post about the worlds shortest man ever documented. The shortest man of the world is from Nepal and his name is Chandra Bahadur Dangi. He was measuring 21.5 in or 57 cm only, that's very short. 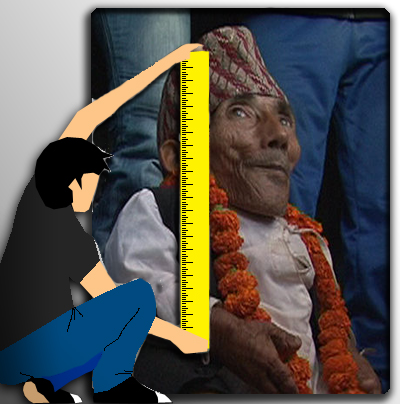 Chandra Bahadur Dangi, the record holder for the worlds shortest man was born on 1939. Not only that he is very short, he also is pretty old. It is somehow surprising that he was just discovered only recently when we know how old he is already. Next to Chandra Bahadur Dangi is Gul Mohammed from India who is 22 in or 57 cm short.